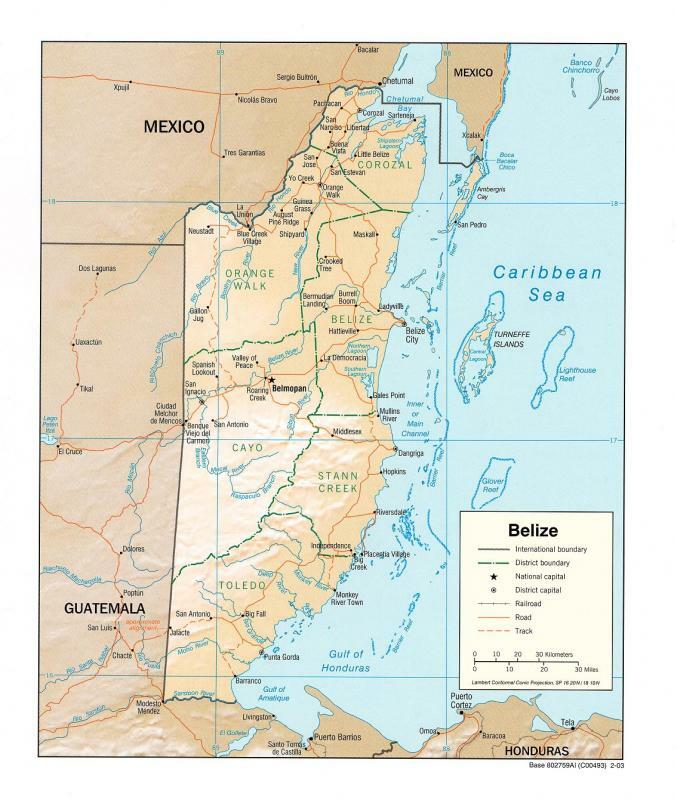 The Belize–Mexico boundary is approximately 250 kilometers (155 miles) long. Inland from the Boca Bacalar Chico on the Caribbean coast, it extends through the Chetumal Bay for about 81 kilometers (50 miles) to the mouth of the Hondo (Rio Hondo). The boundary follows the thalweg of the Hondo and Blue Creed (Rio Azul) upstream to the meridian of Garbutts Fall. It then follows this median southward to the tripoint with Guatemala on the parallel of 17º49′ North. The British Bay Settlement was established in the area which is now Belize1Commonly referred to as Belize during the early British period of settlement, the territory was made the colony of British Honduras in 1862. From 1862 to 1864, British Honduras was administered by a lieutenant governor under the Governor of Jamaica. The name of the colony was changed from British Honduras to Belize on June 1, 1973.in 1638. By the Treaty of Madrid of 1670, Spain accorded recognition to the de facto British possessions in the Caribbean area, but it did not accept Great Britain’s contention that the terms of the treaty included the Bay Settlement. In the Treaty of Paris in 1763, Spain, while retaining sovereignty over Belize, conceded to the British settlers the right to pursue the logwood industry. This was confirmed by the Treaty of Versailles on September 3, 1783, for the area in northeastern Belize between the Rio Hondo and the Belize river. On July 14, 1786, the Convention of London reconfirmed the right to engage in woodcutting, and the logwood concession was enlarged to include the area between the Belize and Sibun rivers, while Great Britain gave up its claim to the Mosquito Coast farther south on the mainland of Central America. Mexico became independent from Spain on September 16, 1810, and the United Kingdom and Mexico signed a treaty of friendship, commerce, and navigation on December 26, 1826. Article 14 of the treaty adopted the limits of Belize indicated by the Treaty of 1786 between Great Britain and Spain. A treaty between Guatemala2Guatemala became independent from Spain on September 15, 1821.and the United Kingdom on August 30, 1859, delimited the present Belize–Guatemala boundary. It stated that the boundary would extend due north (along the meridian) of Garbutts Fall to the Mexican frontier. Art. 3, bis. Her Britannic Majesty guarantees to Mexican merchant vessels in perpetuity the absolute liberty, as at present enjoyed, of navigating the Strait opening to the south of Ambergris Caye, otherwise known as the island of San Pedro, between this caye and the mainland, as well as of navigating the territorial waters of British Honduras. "It is agreed between the Republic of Guatemala and Her Britannic Majesty that the boundary between the Republic and the British Settlement and possessions in the Bay of Honduras, as they existed previous to and on the 1st day of January, 1850, and have continued to exist up to the present time, was and is as follows: Beginning at the mouth of the River Sarstoon, in the Bay of Honduras, and proceeding up the mid-channel thereof to Gracios a Dios Falls, then turning to the right and continuing by a line drawn direct from Garcias a Dios Falls to Garbutt's Falls on the River Belize, and from Garbutt's Falls due north until it strikes the Mexican frontier;"
This International Boundary Study is one of a series of specific boundary papers prepared by the Office of the Geographer, Bureau of Intelligence and Research, Department of State, in accordance with provisions of the Office of Management and Budget Circular No. A-16. Government agencies may obtain additional information and copies of the study by calling the Office of the Geographer, Room 8742, Department of State, Washington, D.C. 20520 (Telephone: 632-2021 or 632-2022).